The musket was invented in 1615 in France. No one knows who invented the musket, It is up for speculation, some believe it was invented by Leonardo DaVinci a little more than 100 years earlier but others say it was Le Bourgeois, a french gunsmith. The musket uses a flintlock. A flintlock is where when the trigger is pulled a small shard of flint strikes a plate of iron to create sparks. These sparks light the gunpowder, which then explodes. This volatile explosion sends the bullet rocketing out of the barrel, along with a cloud of smoke. 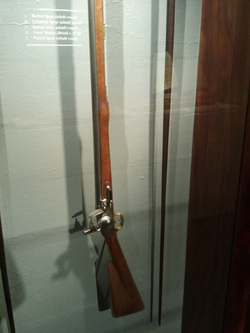 The musket was instrumental in the revolutionary war, and was a hunting tool until the Winchester rifle was invented.